The Vortex Diamondback binoculars are by all accounts ruggedly durable with just reasonable treatment. We wondered what we would find as we started scrutinizing this binocular. There's no little to no argument on the durability. This roof prism design is both lightweight for its various configurations and well balanced. The average person should be able to handle them during extended use without tiring excessively. The hinge construction looks long enough to withstand most drops and bumps without twisting and strong enough to stand up to regular use. The neck strap provided with the binocular is a regular Vortex strap and is wide and cushioned where it rests on the neck. It makes carrying a binocular much more comfortable and easier than a thin strap or one with a cushion that slides on the strap. The padded carry case provided is molded, making it easier to put the instrument away. Another thing that we like about the Vortex Diamondback binoculars is the soft rubber rain guard and tethered caps for the objective lenses. The quality of the rubber is like that usually found on more expensive binoculars and it's easier to keep on the lenses when you want it to be there. It's also easier to take off when you need to look at something! The green rubber used to armor the Diamondbacks isn't what waterproofs them, but it does a good job protecting them from minor drops and bumps in ordinary use. It's a lot easier to hold onto when your hands are wet or cold, too. Those who get out for chilly autumn migratory bird counts, hunters, and many others will appreciate that! Although the right eye diopter adjusting ring doesn't lock in place, it does hold its position well. You'll also want to know that the durable, twist-up eyecups do have a detent feature in the middle so they'll stay put halfway up/down. Optically, you'll find that the Vortex Diamondback binoculars will provide noticeably brighter (clearer and with greater contrast) images in low-light conditions and truer colors than their lower priced Eagle Optics Denali cousins. Also, the field of view is a bit wider than the comparable Denali. How does the Diamondback compare to others for brightness? When comparing them to binoculars costing 25-30% more, you're unlikely to notice a significant difference in your ability to see clearly (brightness), even in the low light conditions of dawn and twilight. The multi-coating was improved during 2009 to enhance the brightness above what the Diamondback originally had. Your OpticsReviewer appreciates the fact that Vortex made the improvement after the model was already introduced - that's a sign of a company putting the customers first! Although the magnification is not as powerful as some binoculars used for astronomy, we feel the brightness of images viewed with the 12X50 Diamondback makes it good for amateur astronomy as well as proving itself as a larger, general-purpose instrument where a more powerful, unwieldy configuration couldn't. In our opinion, the clarity and contrast of image is excellent at this price point - you'll find that they "look through" brush readily to see otherwise hidden wildlife. Color is typically good and true with the Vortex Diamondback binoculars and you're unlikely to notice any chromatic aberrations or distortion. As is the case with most optics, you'll find that images at the edges are not in clear focus, but the sharp-focus "sweet spot" is quite reasonably large across all configurations and the fall-off to the edges is subtle. The Diamondback's field of view is impressive - more generous than most binoculars in its category. The benefits of this will be apparent to birdwatchers and others. You'll be able to see more of the action through your glass with this instrument most others. This is not insignificant and is one of the central criteria many use in choosing an instrument that will be used for viewing activities as opposed to still images. 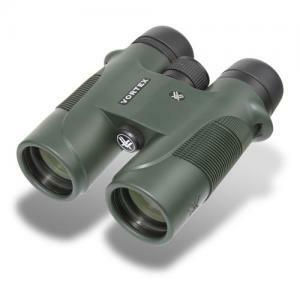 The Vortex Diamondback binoculars' phase corrected roof prisms are made of BaK-4 glass, its glass is fully multi-coated, and it's both waterproof and fog-proof. These are as they should be for a binocular to be taken seriously. It's also tripod adaptable, just unscrew the cap from the front of the hinge. It accepts the standard quarter inch threading on most tripod adapters. While they don't have a direct comparison configuration, consider the 9X36 Diamondback with the Nikon Monarch ATB 10X36. 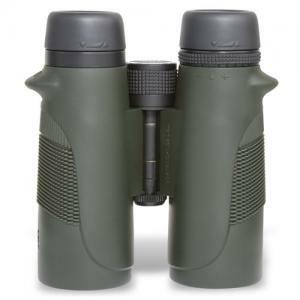 The Vortex Diamondback binoculars have more durable eyecups and higher quality covers for the lenses. The Vortex lifetime, transferrable warranty provides more protection than the Monarch's 25 year limited warranty and no-fault repair/replacement policy at this point. (The transferable warranty is good if you give the instrument to your child or grandchild, for instance.) The optics seem comparable since, at the time of this writing, only the Monarch ATBs with 42 mm objective lenses have dielectric prism coatings. Finally, the price difference between these two configurations has the Vortex Diamondback about $40 less. 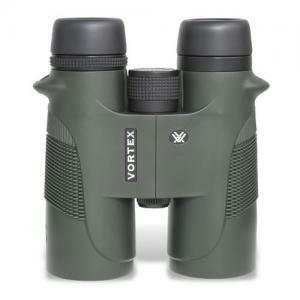 We recommend Vortex Diamondback binoculars as a superior value in their price category. What's a review for if not to help get the best value for money spent? It always pays to shop, of course, even if the result is only peace of mind! While you may find retailers with higher prices, you'll not find any with lower prices than Amazon.com and Amazon.co.uk for the Vortex Diamondback. The average consumer rating for the Diamondback is 5 out of 5 stars. We would guess that the most popular Diamondback configuration is the 8X42 followed by the 10X42. The 8X42 is a historical favorite of many birdwatchers, although some seem to be slowly shifting to favor 10X configurations with improvements in brightness, contrast, and resolution in recent years. The 10X42 is often a general wildlife and hunting favorite as well as serving many working needs.